I've been hearing the phrase "on the wrong side of history" a lot lately, most recently today when President Obama said that Russia was on "the wrong side of history" for its actions in Ukraine. There is already a question about the meaning of the phrase, but I'm wondering about the origin. When was this phrase first used, and where did it come from? the phrase first appeared in books in 1935, disappeared until 1949, and experienced an early spike in usage around 1951. A spike reaching a slightly lower peak occurred in 1967, followed by intermittent but generally up-trending popularity until reaching another high point in 1985. 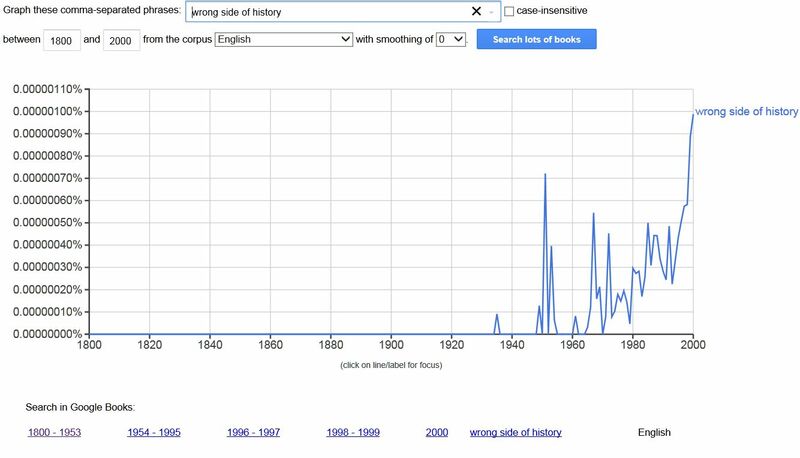 A slight drop-off then was followed by a sharp increase from the early 90s up to a historical high in 2000, the last year of Google's Ngram-available data. The editorial bears the heading, "McDonald and Lenin," and he Times puts itself on the wrong side of history thus: "If the British people regard the advent of Labor Socialists without alarm, on reason is that they know that they have to deal with a Labor government soberly aware of its limitations and its responsibilities...The example of Russia is a virtual guarantee against any tendency on the part..."
Whether the phrase originated with the author of this piece is not evident. 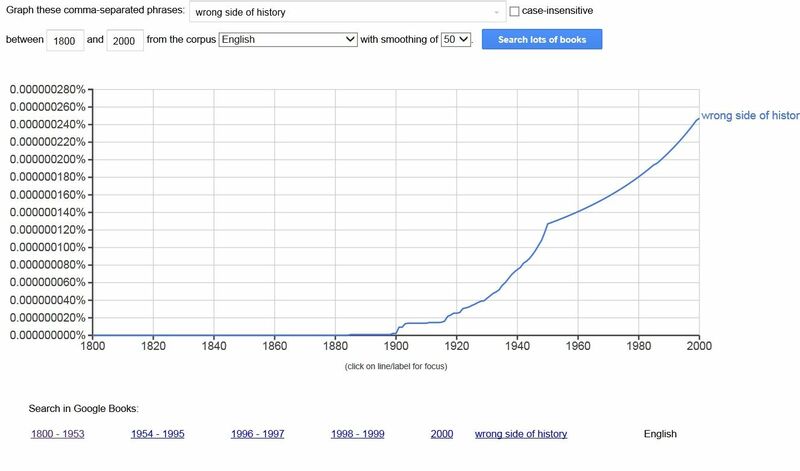 This version of the same Ngram of the phrase “on the wrong side of history” with a "smoothing" of 50, shows the general trend over time from 1800 to 2000. It's no more than a clever take on the very well-known idiom: on the wrong side of the law / on the wrong side of someone. See also the bare idiom. Where did the phrase “in a pickle” come from? Origin of the phrase “mother's ruin”? Is it appropriate to say “I've never been” when referring to a place, omitting the adverb “there” from the phrase?